You’ve made big investments in your 3PL and warehousing to streamline forward logistics and lower fulfillment costs, but if you're not automating your returns, your business isn’t seeing the same diminishing marginal costs. Each return processed is done manually and costs the same as the one prior, driving operating costs up and productivity down. Returns are an integral part of any e-commerce business and involve multiple layers of operations and technology: your website, your carrier, your warehouse, your payment processor, and so on. By leveraging APIs, you can free up expensive holiday labor costs to reinvest in other areas of your business. Add behavioral data to your database to close the loop on your customer's shopping journey. Manage inventory predictability and optimize your staffing needs based on expected returns volume. Use real-time data to inform merchandise buying decisions. Minimize surplus and excess inventory. APIs also present an opportunity to boost brand loyalty and holiday sales by enabling 'Refund at first scan’ experiences. 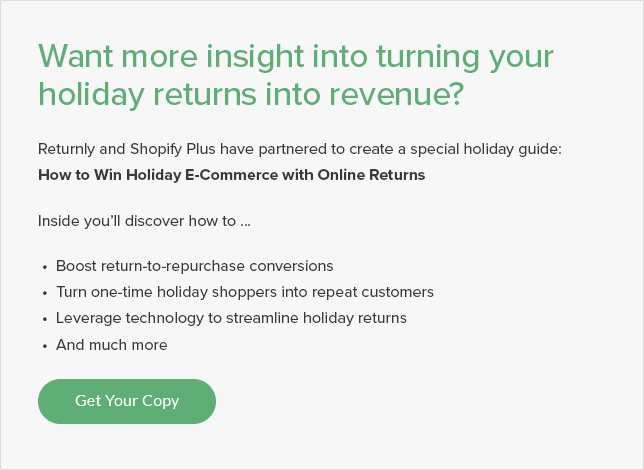 Returners have already gotten through your sales funnel and invested in your product. By delivering the fastest possible refund, you're providing a positive experience that incentives shoppers to buy again. This also provides your business team with more visibility into outstanding order refunds during transit time. Since launching the Returnly API, we’ve seen enterprise merchants integrate with their OMS and 3PL platforms, providing more visibility, automation, and data to manage the post-purchase experience. As we are continuously looking at ways to empower the modern online retailer, we are excited to announce our newest integration with 3PL provider, Whiplash. Whiplash provides retailers with expandable, branded, direct to consumer fulfillment. With our integration, Whiplash users can now utilize our returns functionality, with no manual reconciliation, by simply connecting the two platforms. Here's how it works: Returns get generated through the Returnly interface, creating a Ship Notice on the Whiplash side. Returns are received at the Whiplash facility and processed, as usual, pushing information and automatically reconciling with the Returnly platform. That's it! If you have platforms you'd like to see us integrate with next, let us know in the comments section below. If you're interested in learning more about the Returnly APIs, we’ve created full API Documentation available here.